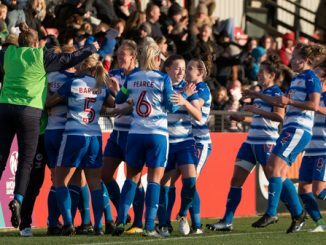 In the FA WSL Continental Tyres Cup semi-finals, an early goal was enough to give Manchester City victory in front of over 2,500 at Chelsea, while Arsenal staged a dramatic late turnaround to win at Reading. 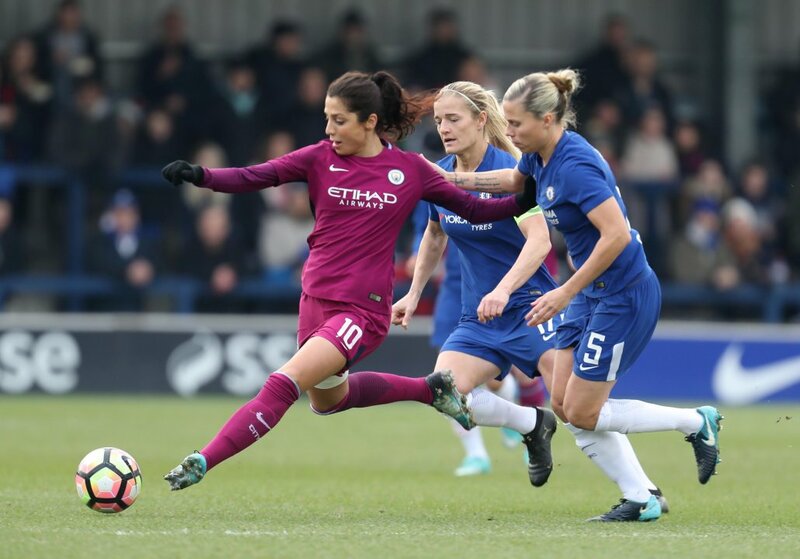 Chelsea were unable to recover from going behind early on, as holders Manchester City went through to the final after Nadia Nadim scored the game’s only goal on 18 minutes. There had first been a crucial block by Steph Houghton after Ji So-yun squared for Fran Kirby to shoot. The visitors then went straight up the other end to take the lead, with a cross from Jill Scott converted by Nadim. Both goalkeepers made good saves as Chelsea’s Hedvig Lindahl came flying off her line to deny Nikita Parris and then Karen Bardsley kept out a Hannah Blundell effort from Andersson’s fine delivery. Substitute Jonna Andersson was involved in another chance but Kirby’s strike was deflected over. Chelsea produced some late chances in a bid to equalise but a Madga Eriksson free kick went just over the bar, Millie Bright hit Erin Cuthbert’s cross straight at Bardsley and from another Blundell ball, Gilly Flaherty headed over the top. Following a swift exchange of goals in the opening minutes, Reading went in front in the second half but were undone as Arsenal struck twice in the last 10 minutes. 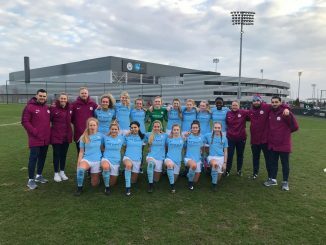 The Gunners opened the scoring in the 5th minute, a low cross beating the defence and Beth Mead putting the ball beyond the reach of keeper Grace Moloney. But moments late the scores were levelled, Brooke Chaplen cutting inside and curling a shot round Sari van Veenendaal. 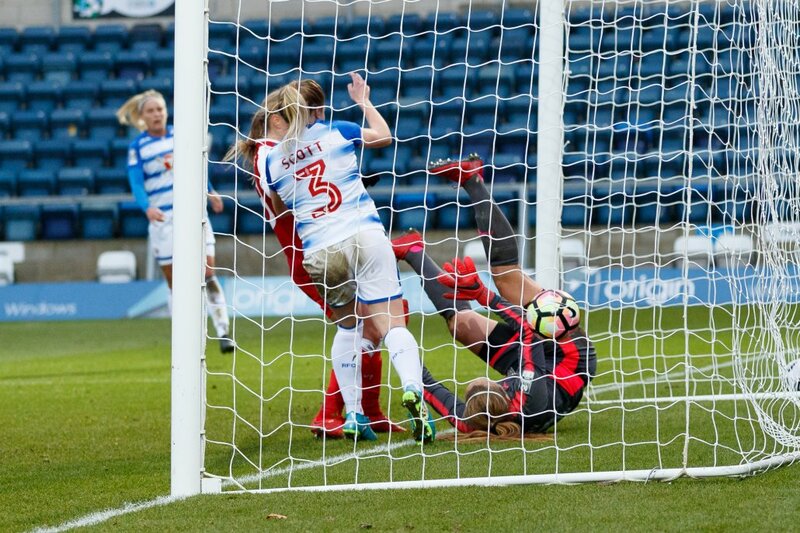 Moloney pulled of a magnificent one-on-one save to deny Danielle Carter just before the hour mark and the Royals then took the lead 10 minutes later, Lauren Bruton firing home from the edge of the box. 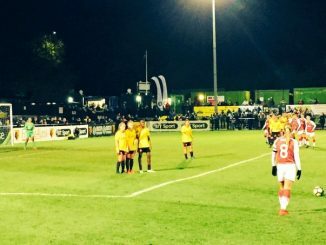 However, 10 minutes from time, Vivianne Miedema equalised for and shortly afterwards, a Jordan Nobbs lob caught Moloney off-guard to restore her side’s advantage. Meanwhile in league action, Birmingham City went seventh above Bristol City on goal-difference, after defeating the Vixens with two second-half goals. Bristol were looking for a third clean sheet in a row and were halfway there after a goalless first half. But Birmingham bounced back from three straight defeats and were sent on their way to three points when Sarah Mayling was brought down by keeper Caitlin Leach and Aoife Mannion converted the resulting penalty in the 54th minute. The hosts doubled their lead 7 minutes later, Marisa Ewers breaking down the left and her cross was drilled in by Charlie Wellings. Ellen White came off the bench and nearly got a third goal but her header was superbly blocked on the line by Jasmine Matthews. Millwall Lionesses saw off Spurs 4-1 to go second in WSL 2, one point behind Doncaster Rovers Belles. The hosts scored just 4 minutes in, as Amber Gaylor headed in Billie Brooks’ deep free-kick. Tottenham came close to a first-half leveller as Wendy Martin saw her strike tipped into the side-netting by Sarah Quantrill and in added time Sarah Wiltshire’s free-kick was palmed over, with the resulting corner eventually going narrowly wide from Katie O’Leary’s overhead kick. Spurs did pull level on 54 minutes though, Wiltshire firing a volley past Quantrill after a lobbed pass from Coral Haines. Ashlee Hincks rattled the bar for Millwall and Brooks was ruled offside from the rebound, before Charlotte Devlin blasted the home side back into the lead. The points were sealed on 83 minutes when a Hincks cross fell for Devlin to hammer home and in stoppage-time Hincks played in Megan Wynne to place the ball into the far corner.